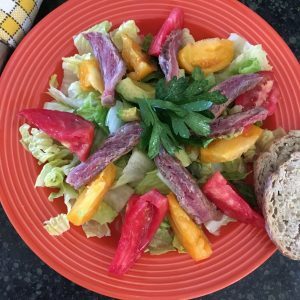 You are here: Home / Uncategorized / Main Dish Salads For Supper–Deconstructed! The steak might be a bit rare for some, but it’s the way my hubby likes it! Make a quick dinner when you’re feeling lazy! Repurpose leftover veggies as well as leftover steak, fish, chicken pork or beans. 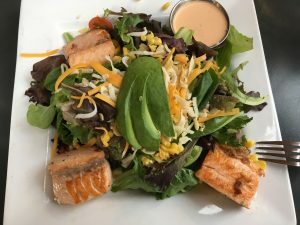 Salmon Salad from Capitol Grill in Santa Fe. 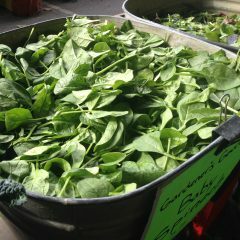 Greens: Choose something tasty and nutritious–the darker green the better! Be bold! Don’t be afraid to explore greens you’ve never had! Veggies: Go to town with cucumbers (I love the English style), jicama, peppers, leftover veggies like green beans and beets. Leftover or canned beans are a perfect way to add low-fat, high fiber protein–black, cannellini, edamame, white and pink kidney beans work well. Fruit: Dried cranberries and raisins are old standbys but chopped dates or prunes are also yummy! Using seasonal fresh fruit such as strawberries, blueberries, peaches, watermelon, apricots and cherries are also delicious. Use your imagination. Complement the fruit in salad with a fruit-based salad dressing made with berries, pomegranate or citrus juice. Grains: Salads are the perfect way to add whole grains to your plate. Quinoa, barley, brown rice, sorghum and farro add some chewy whole grain goodness. Next time you have just a little leftover that you’re tempted to toss, put it in a bag and freeze it for your next salad! Crunchy: Julienne carrots, chopped radish, fresh shucked corn, freshly shucked green peas, nuts, sunflower seeds, pine nuts. slivered almonds, toasted pecans or walnuts. Chewy: This is where the whole grain comes in–brown rice, farro, pasta. Creamy: Avocado, goat cheese, cottage cheese, Ranch or other creamy dressing. Grilled: It’s trendy right now to grill fruits and veggies–these would also be great on salad: asparagus, corn, tomatoes, watermelon. But any grilled protein source–even be it steak or tofu gives a nice caramelized flavor to salad. 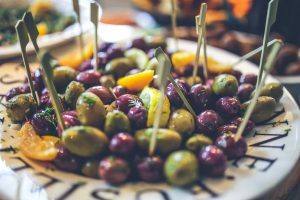 Tart: Olive, capers, sundried tomatoes, strong cheese like blue, gorgonzola or feta, pomegranate seeds, tart cherries, grapefruit or tart orange, kiwi, pickled veggies like onions or cabbage. Spicy: If you like a touch of spice, add red onion or green onions. If you like it picante, add roasted chiles or try adding Sriracha or red chile flakes to your creamy dressing. Finally, if you’re sitting at home with absolutely nothing in the fridge to make salad from, you’re in luck. There are some delicioso restaurant main dish salads from fast casual to fast food. 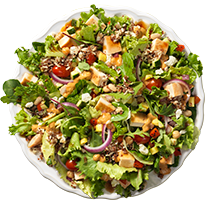 Yes–this is a Fast Food Salad–Power Mediterranean Chicken Salad from Wendy’s! 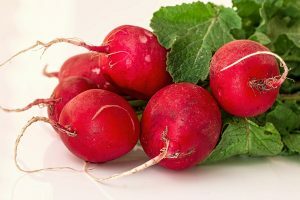 Find more nutrition info and suggestions at my post Healthiest Restaurant Main Dish Salads. « Morning Sickness Recipes to Beat the Queasies!